How do I review a DNA Match? DNA Matches contain a lot of information that can help you confirm whether the suggested genetic relationship indicates a previously unknown family member. The Review DNA Match page displays a single DNA Match in detail, presenting different components that you can review to go delve deeper and reveal more. 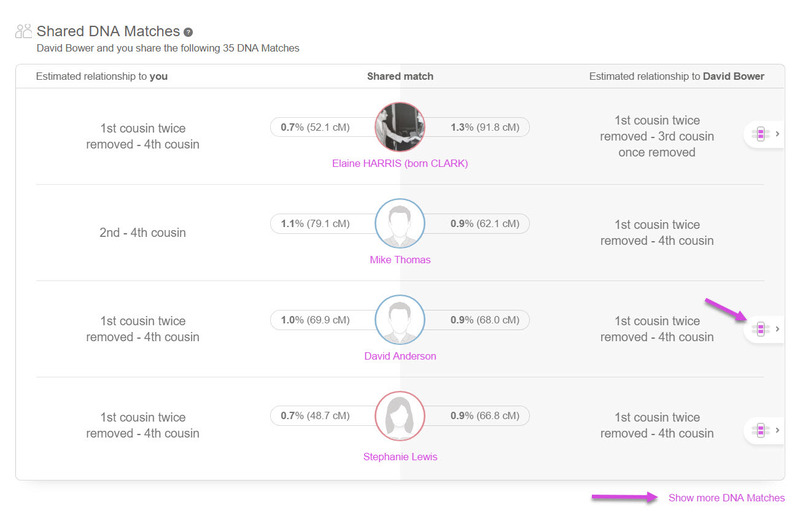 The Review DNA Match page presents new components that help you understand each match in a larger context and determine whether the estimated relationship is your family member. 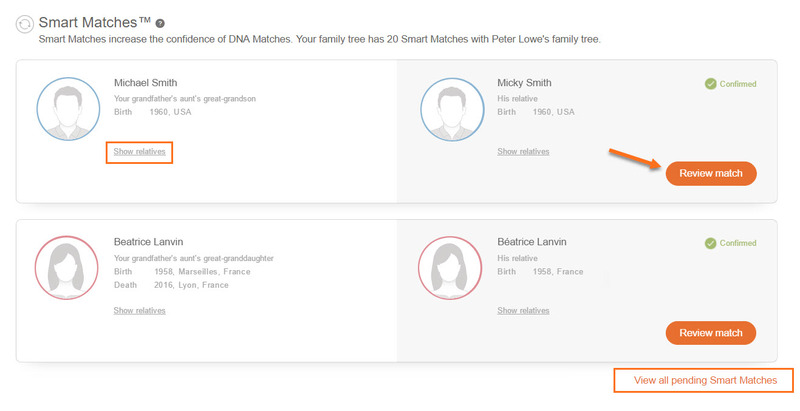 At the top of the page, you will find the ‘Contact’ button to communicate with your match directly, the option to view the match’s placement in your family tree, and the option to add notes to the DNA Match. Below that, you will see your estimated relationship and values describing the quality of the match. Click the “info” icon to see a full explanation about those values. Your Smart Matches are very strong indications of likely family relationships. For example, if you get a Smart Match who is related to people you already know for a fact are your relatives, then it is very likely that you and your Smart Match are related. Shared ancestral surnames are family names that appear both in your family tree and in the family tree of your DNA Matches, going back up to 10 generations. An ancestral surname that you share with a DNA Match could point to the identity of the shared ancestor from whom you both inherited the same DNA segments. If you and your DNA Match share an ancestral surname, the screen displays the ancestor(s) who had that surname. There is also an option to view all ancestral surnames at the bottom of the screen. Shared DNA Matches are people who are genetically related to both you and your DNA Match. Shared DNA Matches can increase the confidence in your DNA Matches and help you learn through which side of the family your DNA Matches are related to you. The feature first shows matches that are the closest, on both the paternal and the maternal side, respectively. That means that the closest estimated relationships are at the top of the list. - On the left side, you can see the estimated relationship to you. - On the right side, the estimated relationship to your DNA Match. - The shared DNA Match is displayed in the middle along with the value of the DNA Match for each (paternal or maternal) side. On the right of the estimated relationship, you will see an indicator for DNA Matches who have triangulated segments with you (or the person whose DNA kit you manage) and a shared DNA Match. Triangulated segments are shared DNA segments that you and two or more DNA Matches all share with each other, and therefore likely all inherited from a common ancestor. You can hover over the triangulated segment icon, and see in the tooltip how many triangulated segments the root person (you or the person whose DNA kit you manage), the DNA Match, and the Shared DNA Match, all share with each other. When you click on the triangulation icon, you will be taken to the Chromosome Browser where you, the DNA Match you were reviewing, and the shared DNA Match that you both have in common, will automatically be loaded as the comparison set. This allows you to review triangulated segments quickly and efficiently, without guessing which matches will triangulate and loading them in the Chromosome Browser manually. To learn more about the Chromosome Browser, please read: How do I use the Chromosome Browser — One-to-many? Click the name of a shared DNA Match to be redirected to the DNA Match review page of this individual. Click ‘Show more DNA Matches’ at the bottom of the page to reveal more. Our Shared Ethnicities section allows you to compare the ethnicities of your DNA Matches to your own ethnicities. 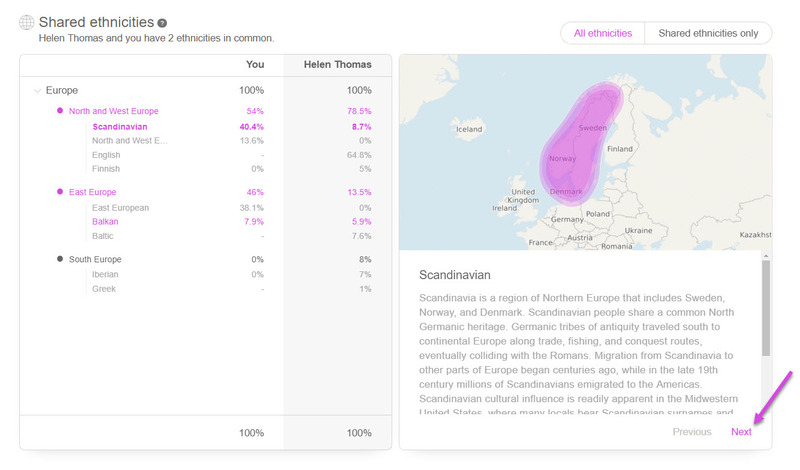 With this feature, you can discover the regions where you have common ancestral origins and therefore which side of your family the DNA Match is likely related to. On the left side, you can compare your ethnicities percentages with the percentages of each of your DNA Match’s ethnicities. Click one of the ethnicities listed to see a description on the right panel. You can also click “Next” at the bottom right to switch from a region to another. By default, you will see all the ethnicities that you and your DNA Match have. Click Shared ethnicities only” on the top right to see only the ethnicities you and each of your DNA Matches have in common. The pedigree chart shows up to 5 generations of the direct ancestors of your DNA Matches. It is a helpful tool when looking for common ancestors and for detecting familiar names that can help you figure out how you are related. You can switch back and forth between the view of your DNA Match pedigree chart to the view of your own pedigree chart by clicking on the tabs above the chart. To view the entire tree of your DNA Match, click “View full tree” in the bottom right corner of your DNA Match’s pedigree chart. 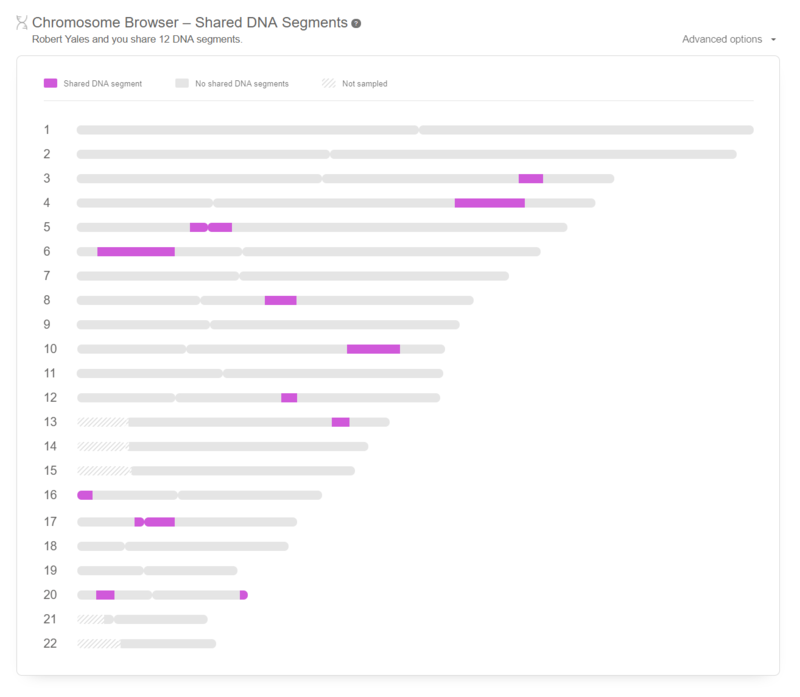 The Chromosome Browser for shared DNA segments is a visual tool allowing you to locate the DNA segments you share with a DNA match. Shared DNA segments, also referred to as ‘matching segments’, are the sections of DNA that are the same between two individuals. These segments were most likely inherited from a common ancestor. On the Chromosome browser, you can see your 22 pairs of autosomal chromosomes and where the DNA segments you share with the other person are located on the sequence. On each chromosome, look for the purple bars which represent the matching segments between you and the DNA match. The grey segments are segments that don’t match. The white striped segments represent the DNA markers which are not sampled for analysis. To learn how to use the Chromosome Browser for shared DNA segments and what information you can take from it, please read the following article: How do I use the Chromosome Browser for shared DNA segments? Please note: Access to the enhanced features of the Review DNA Match page may require a site subscription. How do I interpret the possible relationships indicated on a DNA Match? What does the percentage for the shared DNA mean? When describing cousin relationship, what does 'removed' mean?